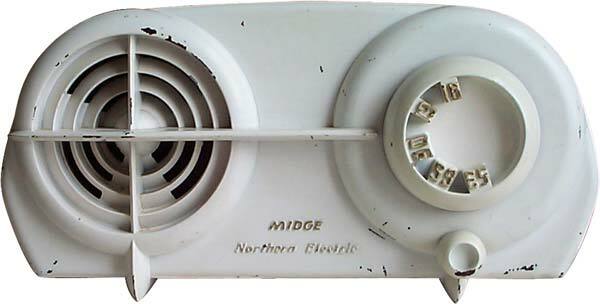 Northern Electric model 5708 "Midge"
A double bullseye design, which bears a passing resemblance to the 1951 Crosley "Serenader" series. The Off/On/Volume knob and the tuning dial are bakelite, painted the same as the cabinet. There is at least one other similar version, a model 5704, which seems to be identical in appearance. I've also seen a model 5808 which has the same cabinet, but the dial and volume knob are shaped differently, in clear plastic with gold-tone brights.